Sabal Trail plans to drill under the Withlacoochee River in Georgia and the Suwannee and Santa Fe Rivers in Florida. On July 16th the Florida Department of Environmental Protection published their intent to issue an Environmental Resource Permit to Sabal Trail Transmission, LLC to construct and operate a 36-inch diameter natural gas pipeline in Florida. WWALS responded by filing a petition to Florida DEP requesting an administrative hearing to oppose the issuance of this permit. 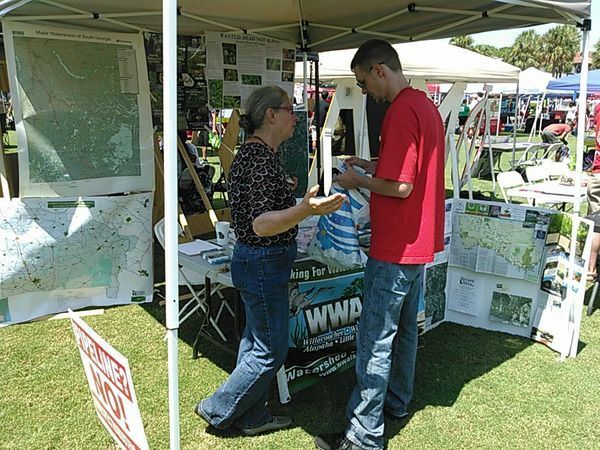 As the Waterkeeper® Affiliate for the watersheds of the Withlacoochee and upper Suwannee Rivers, it is the duty of WWALS to try to protect the environmentally sensitive area that the pipeline is supposed to pass through. The construction of this pipeline is a hazard to our underground limestone formations, spring conduits and water quality. Not to mention, there is a threat of explosions and leaks. The fracking required to get the natural gas is a hazard to water supplies at the source. Also, the natural gas carried in this pipeline is slated to be used by people in Florida south of Orlando, and possibly for export. There will be no benefits to the people in south Georgia or north Florida, but those are the folks that will bear the burden of the hazards. Please fill out our Board Member Application if you are a dedicated WWALS member who shares the ideals of our organization, supports our efforts to advocate for our watersheds, and are interested in taking an active part in WWALS activities. Gretchen Quarterman, chair of the WWALS membership committee, and John S. Quarterman, President of WWALS, operated a booth at “The Happening” event at Valdosta State University, on August 27th. They spoke with students, faculty and community members about what WWALS is involved in and distributed educational materials. Board members Bret Wagenhorst and Dave Hetzel met with Georgia Congressman Austin Scott on August 12th to discuss getting the Alapaha River designated as a National Wild and Scenic River. The Congressman expressed his reservations in regard to private property rights, but said he would look into the matter. It was a fun and diverse group that joined our August 15th Suwannee River outing. We had Florida and Georgia participants, as well as a family from South Africa and someone from Venezuela! The ages of participants ranged from 14 to those in their 60’s. Our outings are fun for everyone. We saw some beautiful springs and a unique cave system that is “better than Disney World.” We took a photo of our group where The Sabal Trail Pipeline is proposed to pass under the Suwannee. The Withlacoochee River Water Trail committee has welcomed several new members and is currently organizing an event to promote interest in the Water Trail at Valdosta State University in tentatively scheduled for February 27, 2016 at 1:30 pm. The event will include a discussion about what a water trail is and how it can benefit the community. We plan to have several esteemed speakers who will present interesting topics related to the water trail. We are planning to hold a logo contest for the water trail among several local college students and announce the winner at our event. Check out the WWALS Calendar for more details. This entry was posted in PR and tagged conservation, Newsletter, north Florida, PR, river, south Georgia, Tannin Times, watershed, WWALS, WWALS Watershed Coalition on October 7, 2015 by jsq.